If there is one thing, other than waterfalls, that I search for when I visit a new area of Pennsylvania, it’s trains. 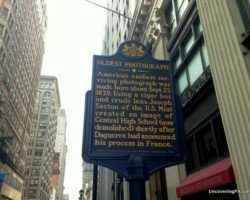 I realize that makes me sound like an overgrown child, but I really enjoy anything to do with Pennsylvania’s rich railroading past. 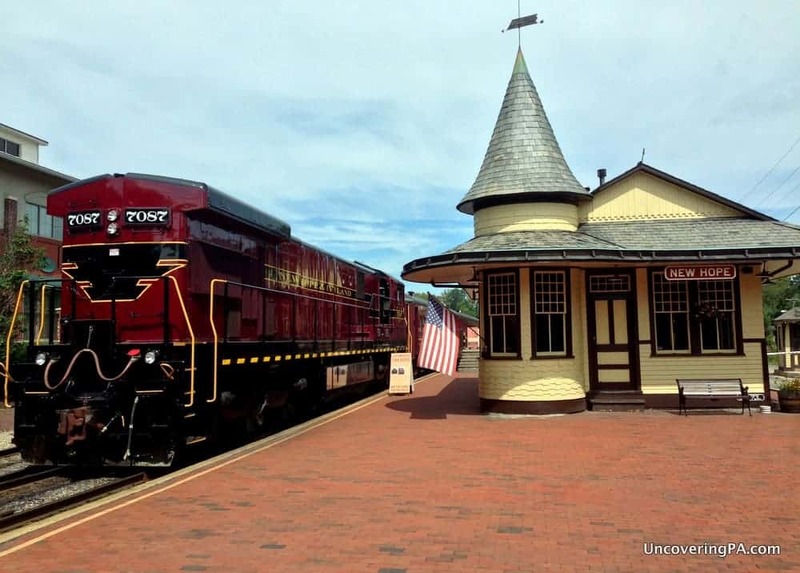 So, when I visited New Hope in Bucks County for the first time, I was excited to discover that the town was home to a heritage tourist railroad: The New Hope and Ivyland Railroad. The New Hope and Ivyland Railroad runs on what used to be the New Hope Branch of the Reading Railroad. The track ran from Philadelphia’s Reading Terminal to New Hope in Bucks County. In addition to providing commuter and freight services, the line also brought patrons up to the Bucks County Playhouse in New Hope for performances, returning them to downtown Philadelphia after the show was over. Today, the line no longer provides passenger service to Philadelphia, but does offer short excursions for those looking to get a taste of what it was like to ride on the line. 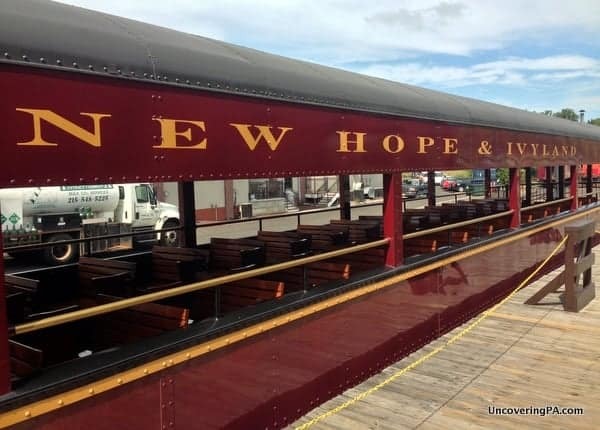 Service on the New Hope and Ivyland trains runs from New Hope to Lahaska. In Lahaska, the train pauses for a few minutes while the engine switches ends, before returning on the same track back to New Hope. All told, the trip takes about 45-50 minutes for the entire ride. The New Hope and Ivyland Railroad train makes its way to Lahaska. There are three categories of seats for those riding the train. Coach and first class are interior seating, while open-air seating is also offered. When I rode the train, I opted to sit in the open-air seating to get a more unique experience. I really enjoyed the feeling of the wind rushing through my hair and even had the chance to stand at the back of the train and watch the track pass underneath us. While I’ve read some reviews about the diesel engine producing unpleasant fumes that made the trip somewhat uncomfortable for those in the open-air car, I can’t say that I noticed anything (and I tend to be especially sensitive to diesel smells). On the way to Lahaska, one of the conductors offers a bit of commentary about the operation of the train and the places you are passing. While the tracks might not pass through any exceptional scenery, the area is still beautiful, and there are several interesting historical buildings and bridges that are pointed out on the ride. Unfortunately, the commentary can be a bit difficult to understand if you are sitting outdoors. Given how frequently the whistle blows, I’m not sure that this can be avoided; however, it’s worth noting if you are taking the trip specifically to learn about the surrounding area. It’s also worth noting that the train runs two different types of engines: a steam-powered engine and a diesel engine. Generally speaking, a steam locomotive is the more classic way to take a historic train ride, but I still enjoyed the experience of riding behind the historic diesel engine. The website doesn’t denote which locomotives are running on which days, so you might want to call ahead if you have a strong preference. The open-air car on the train. 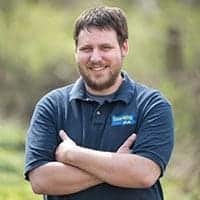 If you read reviews of the New Hope and Ivyland Railroad on sites like TripAdvisor or Yelp, you’ll notice that they are quite a mixed bag. Some people love the ride, while others are less than thrilled with the experience. 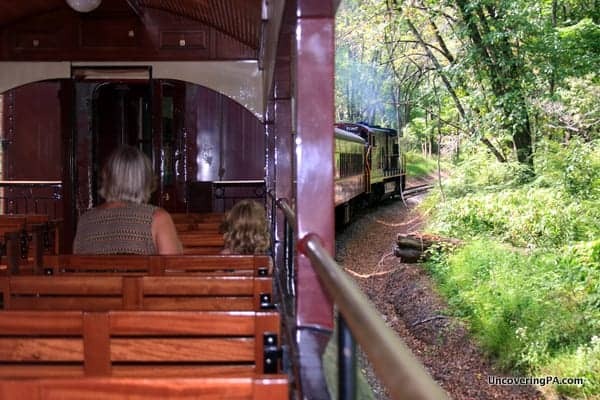 In my opinion, the train might not be the most scenic historic train ride in Pennsylvania, but it does offer a great chance for those who want to experience a short train ride within a close proximity of Philadelphia. 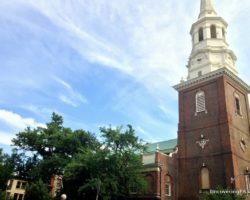 So, if you have a train fan in your group, or you’re just looking for something unique to do in New Hope, Pennsylvania, the New Hope and Ivyland Train might be right up your alley. Tickets for the New Hope and Ivyland Railroad can be purchased on their website. For their regular trains, tickets cost between $21-29 for adults, $19-27 for children between 2-11, and $4.95 for children under two (Yes, my 2-month old baby needed a ticket to ride on the train). Special events are offered during different times of the year including Santa Trains, Fall Foliage excursions, and dinner trains. Note: My visit to the New Hope and Ivyland Railroad was hosted by the railroad. However, the opinions expressed are my own. 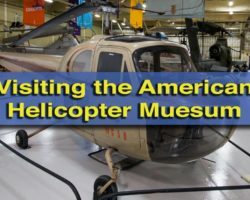 Looking for other places to visit nearby? 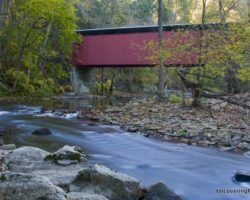 Check out the area’s covered bridges, Stony Garden, Aquetong Creek Falls, and the Mercer Museum. 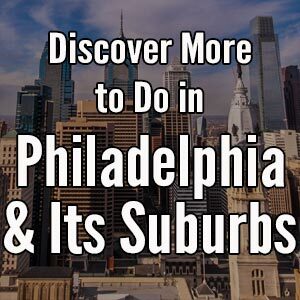 There are also many great places to eat and stay in Bucks County.